NLP Training is your key to becoming an NLP-Practitioner, NLP-Master, NLP-Coach or NLP-Trainer. This NLP Training enables you on various levels, to super-charge your own self-discovery on the one hand, and on the other, it gives you myriads of tools to transform your communication with others. Here you get to know, on a deep level, your own communication needs, improve your ability to self-actualize and with a positive outlook change personal mental habits that no longer serve you. Neuro-Linguistic Programing is a cybernetic-psychologically based Methodology which enables people to improve their lives and relationships in powerful ways. Through the NLP Training Course, you too can learn to optimize your communication, to creatively set and reach goals and to vastly improve the quality of your life. This NLP course of training positively influences your private life and your professional life as well. I mean, why not? When your communication is improved, with yourself as inner dialog, and to others as well-formed flexible rhetoric, it's just logical that both professional and private life shows vast improvement! By really learning how you tick, you feel more confident, have more energy and engage with others in more satisfying ways. Through this NLP Training Course, for example, you will learn to regulate your own inner weather, your moods and your "inner states" the way YOU want them... not your parents, not your teachers, not your husband, boyfriend, wife or girlfriend: YOU! In this way you begin to grasp firmly the steering wheel of YOUR own life and begin to live much more fully. After all, isn't this what we all want? 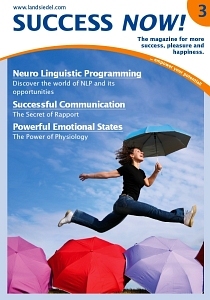 In the NLP Practitioner-Training you learn the basics of Neuro-Linguistic Programming and exactly how to use them. This training is made-to-order for anyone who desires self-improvement, self-realization or self-fulfillment. Whether your focus is to live your life with more Élan, or to improve soft-skills in your work, this training provides you not only with the tools you need, but also with new skills to fashion your own custom-made new tools. In fact, it often happens that a practitioner registers to improve skills in the workplace but discovers an even more powerful effect in her private life! It's only natural that when you cultivate and enrich your personality, you will be more successful in your chosen field. This NLP Training Course is dedicated to just this goal. The ancient Greek philosophers often used the word "Entelechy". It comes from the same root as Intelligence. It refers to an inherent potential that lives within us all, something like a blueprint for our own growth. The NLP Practitioner Training is like high-octane fuel for this growth. You learn the basis for your own creativity, new learning strategies and how to optimize your sense of time-planning. The NLP Practitioner Training teaches you to optimize your focus and your internal state within seconds in ways that empower your own goals, your own dreams and your own needs. Of course, after you've done this for yourself, you will find yourself through this method ready and able to do this for others as well. This coaching ability, the ability to positively influence others and to enable them to live how THEY want to live, is the essence of coaching! Through a highly effective combination of theory and practice you learn both the principles of language and how they apply specifically to your daily personal and professional life. These principles are drilled until they become second nature. In addition, you get the opportunity to repeatedly use these principles to coach others, be coached yourself and observe how coach and client effectively interact by watching others coach. You learn to develop your observational powers and to optimize your ability to influence yourself and others in highly effective ways. In the more advanced NLP Master Training you deepen and broaden what you learned in the NLP Practitioner Training. This knowledge and practical experience are integrated in ways that make it feel like instinct. In fact, both your instinct and your empathy are highly strengthened through this course of study. Empathy, the ability to mirror and to "feel with" someone else is a soft skill that has profound personal and professional implications. The so-called "Formats" you learned and integrated in your NLP Practitioner Training become embedded in a deeply satisfying body of knowledge. Through this integration you acquire the ability to not only follow the steps, or the 'recipe' of the formats, but to improvise and creatively utilize the techniques and principles to fashion custom-made formats for yourself, your work colleagues or your clients. There is as well, in this NLP Master Training, a strong emphasis on self-knowledge and self-development. You can only accompany your client through processes you yourself have gone through. In this NLP Master Training you discover how to personally go through these cathartic processes. Here you gain a profound sense of self and learn to express this sense in ways that correspond with your highest morals and ethics. This NLP Master Training is an essential and valuable continuation of the NLP Practitioner Training. It is mandatory for admission into the NLP Trainer Training. In this advanced training to become an NLP Trainer you receive the skills and knowledge to train NLP yourself. This knowledge and these skills are drilled and tested in ways that solidify NLP into a true body of knowledge. You have the ability to not only explain, in the simplest and most effective ways possible what NLP is, but also to spontaneously answer tough questions and to react flexibly and positively in the most rigorous coaching situations. In addition, you are required to assist in NLP Practitioner Trainings and NLP Master Trainings. This assistance super charges your knowledge in ways difficult to anticipate. You get a "META"-Perspective on NLP, how it's used and how it's taught. A most profound experience! In this NLP Training Program there is a strong focus on personal congruence and authenticity. In this training you learn to literally and practically "Walk your Talk". Through this personal authenticity, you learn understanding, tolerance and enthusiasm for the myriad styles of human thinking and behavior. You learn to not only represent NLP, it's technique and methodology, but to expand it as well. This NLP Training Program is for those who are dedicated to bringing NLP and it's deep philosophical, psychological and behavioral tenets more broadly into the world. If you're enthusiastic and passionate about human development in general and NLP specifically, then this NLP Training Program is FOR YOU!!! Here you will learn presentational skills, charisma skills and training organizational skills at the highest level. You will learn to practically and simply demonstrate any and all theoretical knowledge you present, and you will develop your own unique personal training style. Trainers have unanimously noticed, without exception, that the development of their personal potential through this NLP Training Program has repercussions far beyond training NLP trainings alone! Coaching as a profound means to guide and accompany a client towards their own potential has its roots in many different methods and models. In the NLP Coach Training you will learn the most effective principles and practices available. Through these "Best Practices" in coaching you will integrate these various approaches in ways that suit YOUR personal needs, competence and coaching style. In this NLP Coach Training you are presented with an integration of systemic, short-term, client-centered therapy, family constellations, kinesiology, cybernetics and neurology among others. The requirement for this NLP Coach Training is the NLP Practitioner Training. Whichever NLP Training Program, or Programs, you choose, they have some important similarities. In all these trainings you get to know people who will potentially become colleagues, employers or employees, clients and close personal friends. In other words, NLP Training Programs are a rich source of all-important "Networking". You never know which connection will pan out into profitable business opportunities, so it pays to cast your net broadly. NLP Training Programs allow you to do just that. While doing this, you have ample opportunity in all training programs, to work on your own goals, your own less-functional habits and "programming" in an open and positive atmosphere. The NLP Training Program groups develop a powerful synergy which supports and encourages YOUR personal and professional goals and potential. So whichever NLP Training Program you choose, you can be sure you will get back exponentially more than you spend in time, energy and money.